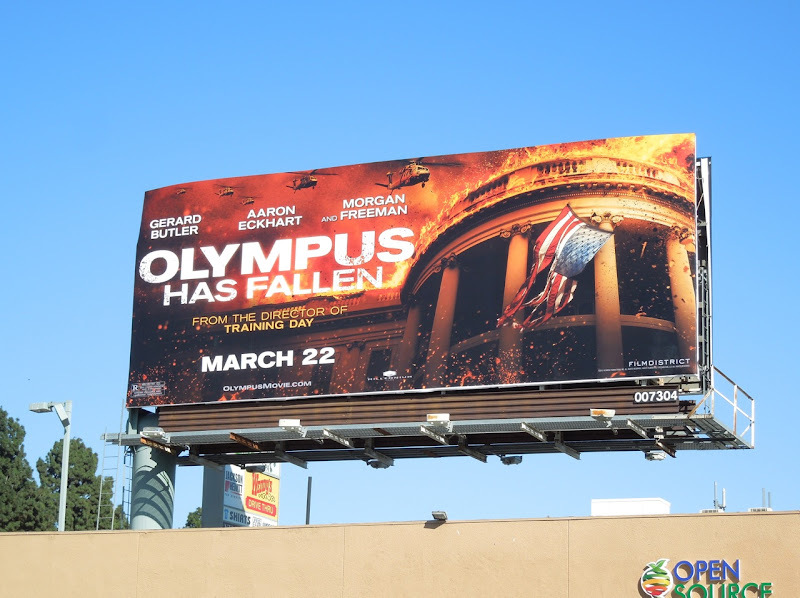 You know, you wait around for one Die Hard style thriller about the U.S. President being held hostage by terrorists in the White House and what do you know, two come along at once. 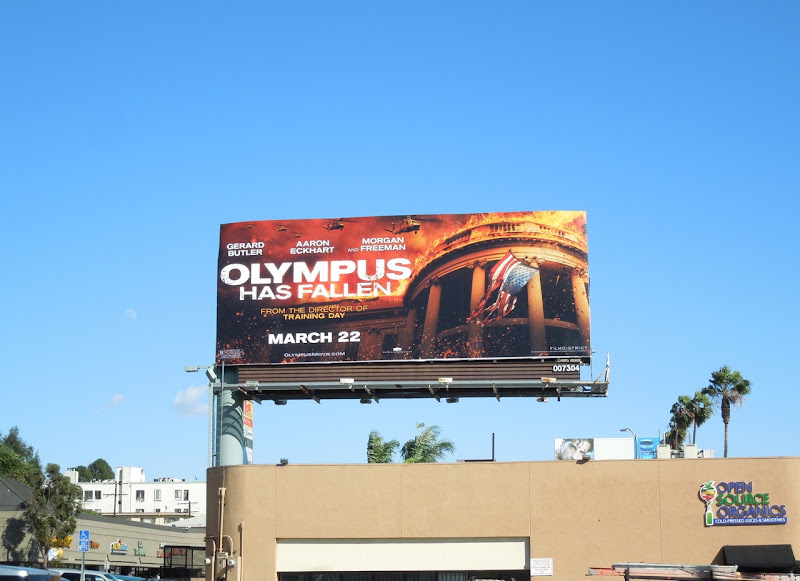 First out of the gate it seems is Antoine Fuqua's Olympus Has Fallen, beating Roland Emmerich's White House Down to the the big screen. 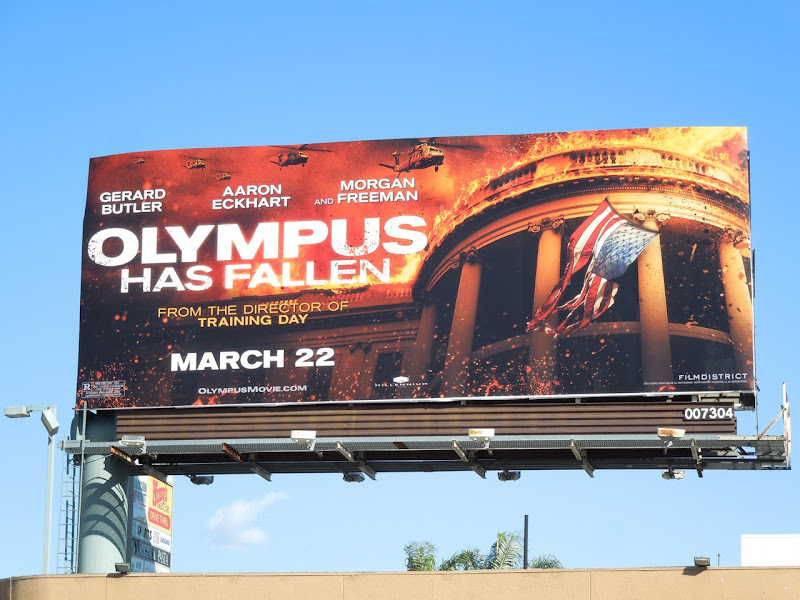 This question is, can Gerard Butler halt his run of box office flops as a disgraced former Presidential guard, especially as he's up against Hollywood flavour of the month Channing Tatum. 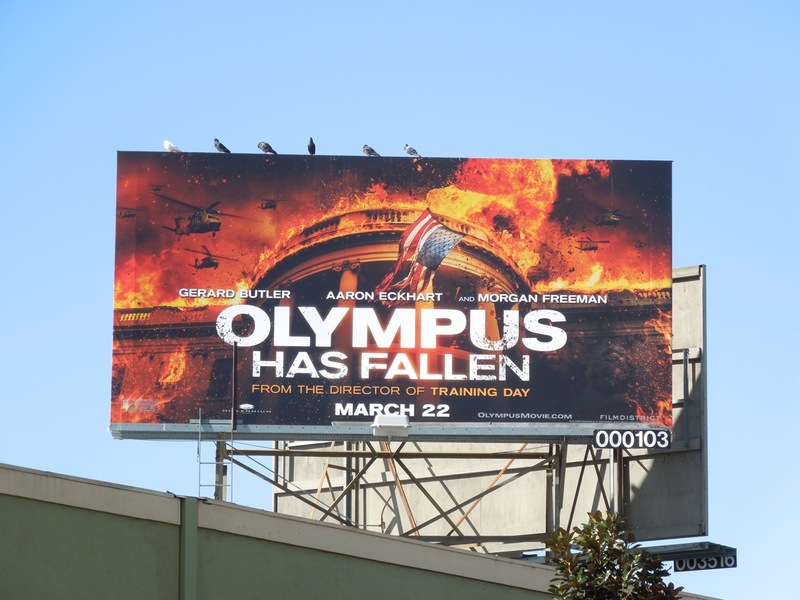 This Olympus Has Fallen billboard certainly grabs your attention with its iconic national monument in flames and was snapped along Sunset Boulevard at La Brea Avenue on February 20, 2012. 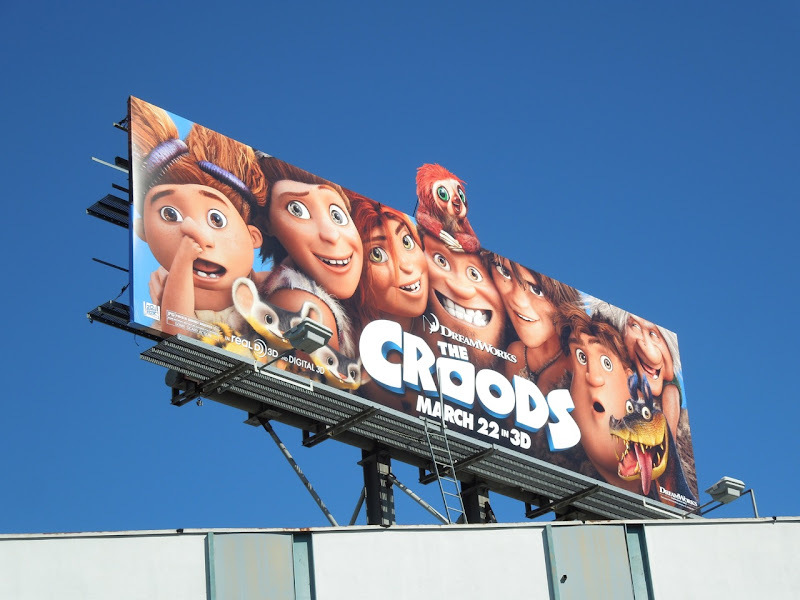 Last year's competing fairytale fantasy movies Mirror Mirror and Snow White & The Huntsman didn't break any records, so let's see if this action movie can fare better. 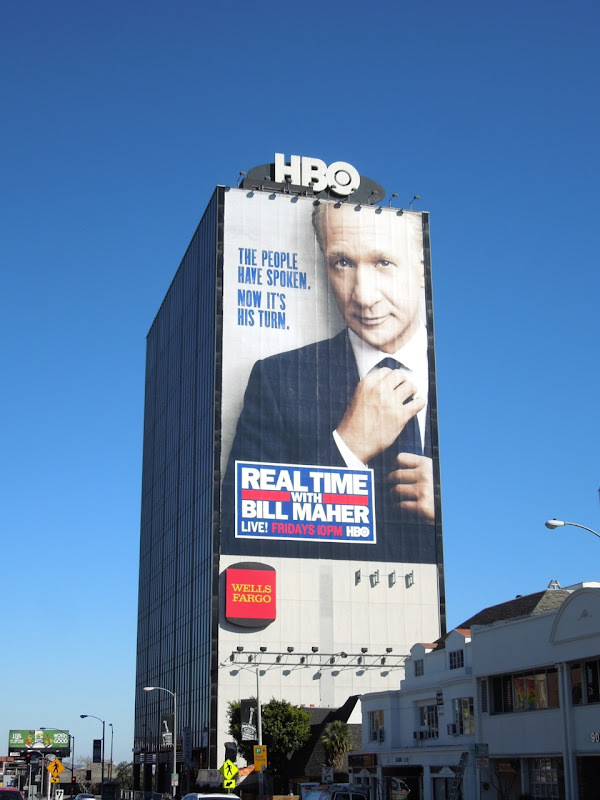 Daily Billboard always enjoys the witty taglines that accompany the Real Time with Bill Maher billboard creatives, like these ads following the recent U.S. Presidential Election. 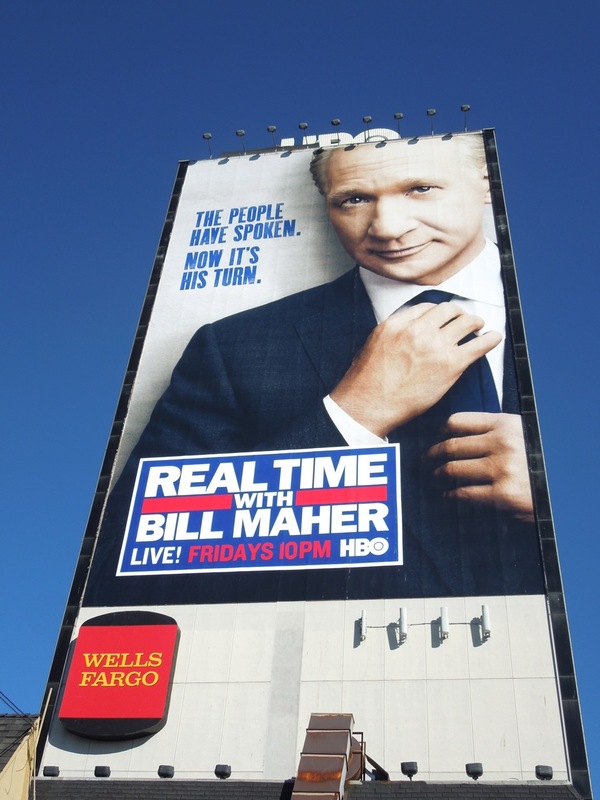 It's a clever way to make a billboard, which mainly features a headshot of the comedian and host, a bit funnier and attention grabbing. 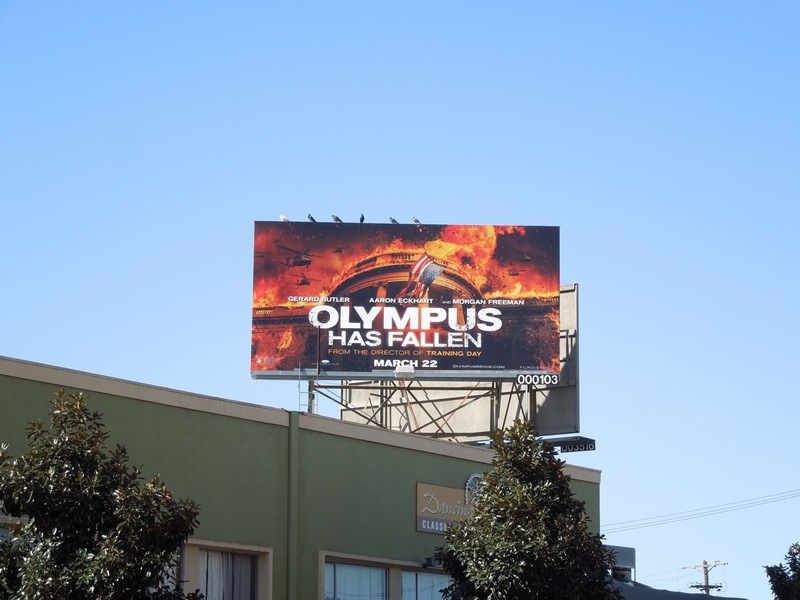 Plus 'The people have spoken. 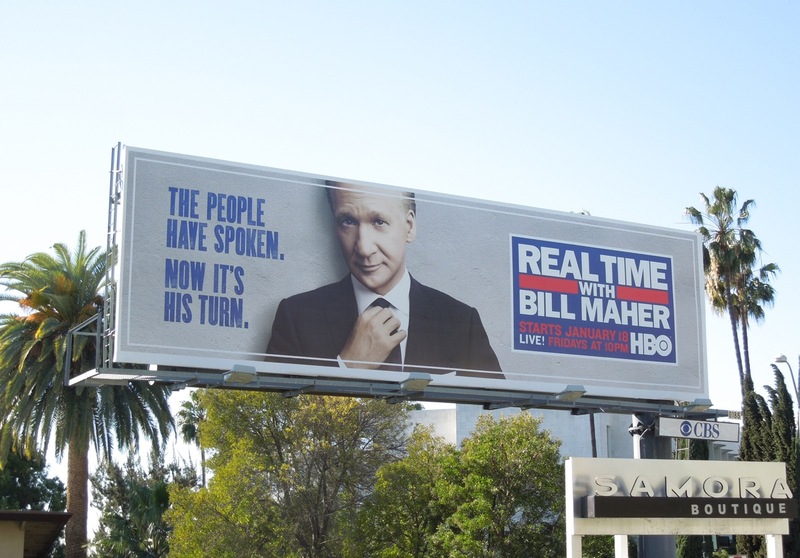 Now it's his turn.' 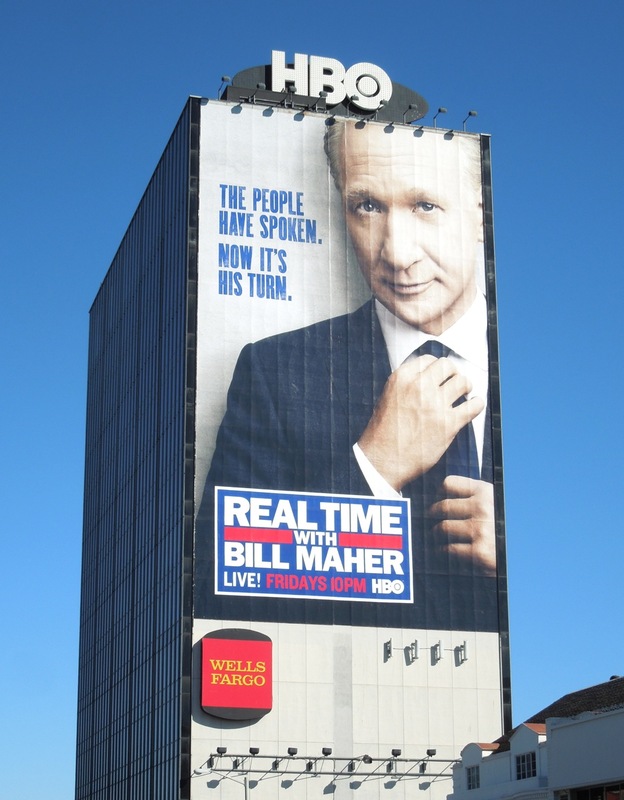 copy is certainly in keeping with Bill Maher's insightful commentary on all things political and current events in the media. 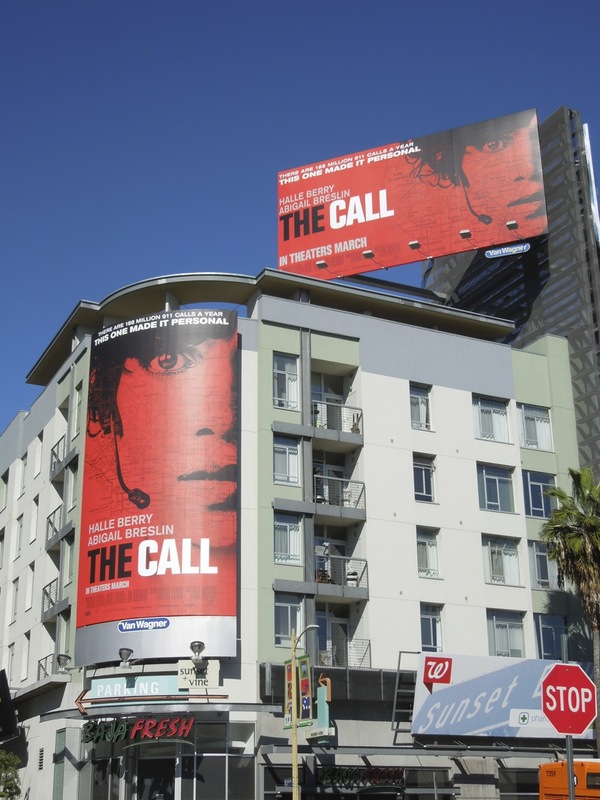 The super-sized creative was spied towering over L.A.'s Sunset Strip on February 20, whilst the standard landscape billboard was snapped further east along Sunset Boulevard on January 3, 2013. 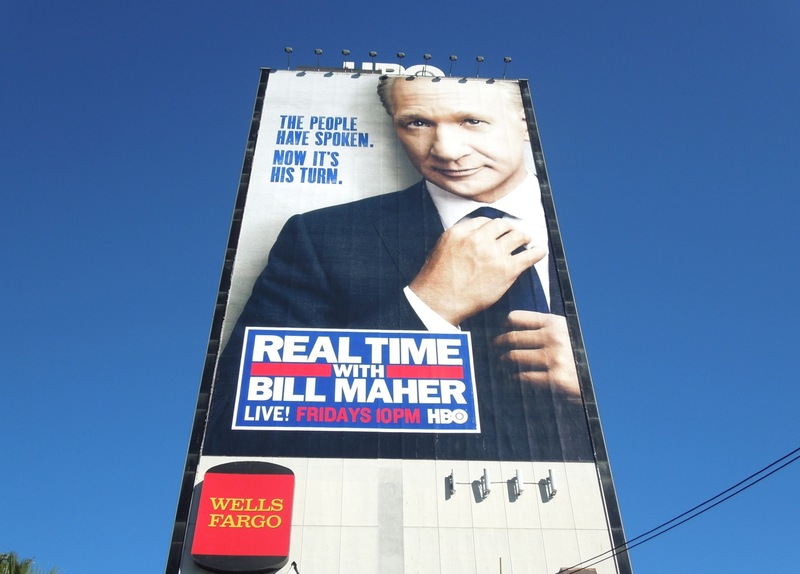 If you're a fan of the political satire talk show, be sure to check out these previous Real Time with Bill Maher billboard ad campaigns. 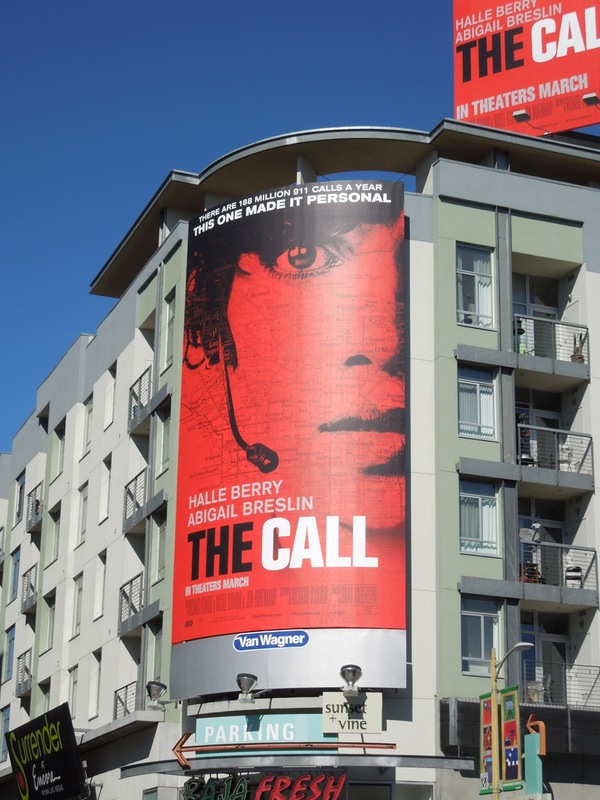 UPDATED: It really is amazing how creative you can be with a man in a suit (who exists in the thorny world of politics and current affairs) and some clever copy season after season. 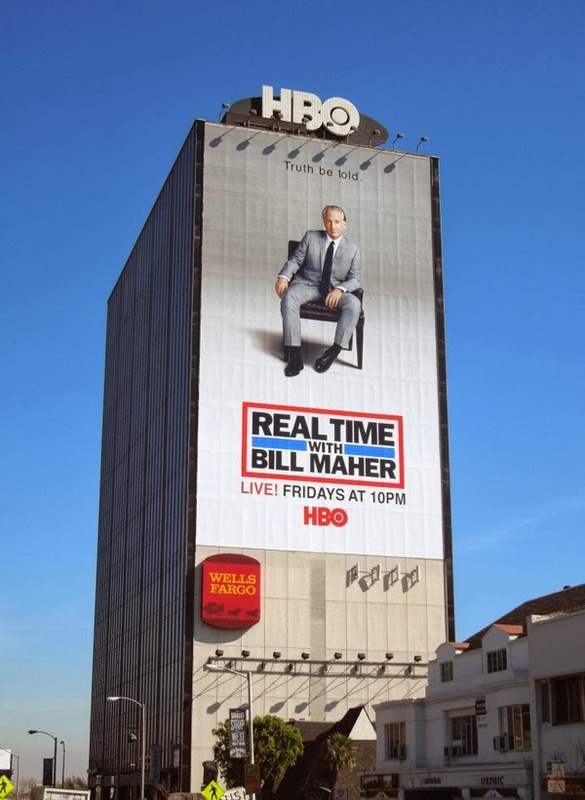 Truth be told, that's pretty impressive. 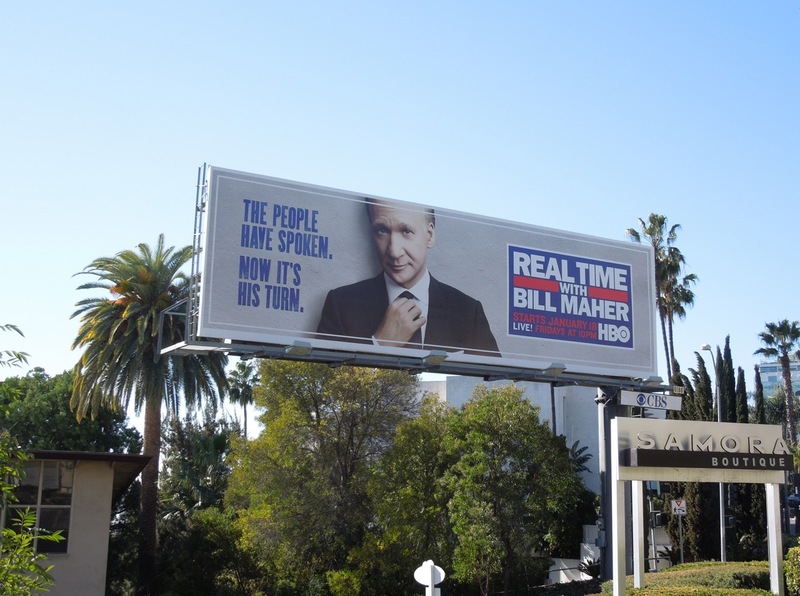 This simple, but arresting, giant twelfth season billboard for Real Time with Bill Maher was spied dominating the Sunset Strip eastbound skyline on February 14, 2014. 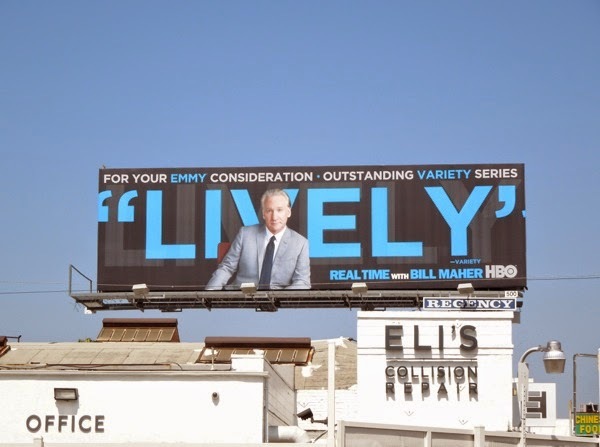 UPDATED: In addition, here's the 'Lively' ad creative used to garner nominations for Real Time with Bill Maher for the 2014 Emmy Awards. 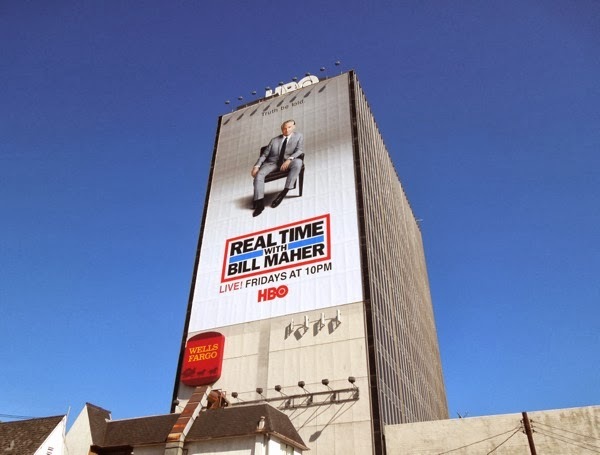 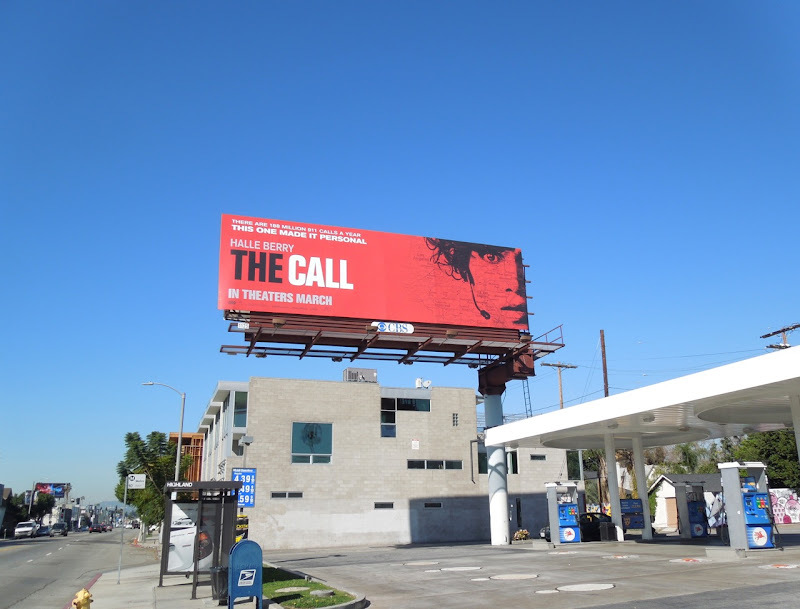 This billboard which is part of the 2014 HBO Emmy Consideration ad campaign was spied along L.A.'s 3rd Street on June 13, 2014. 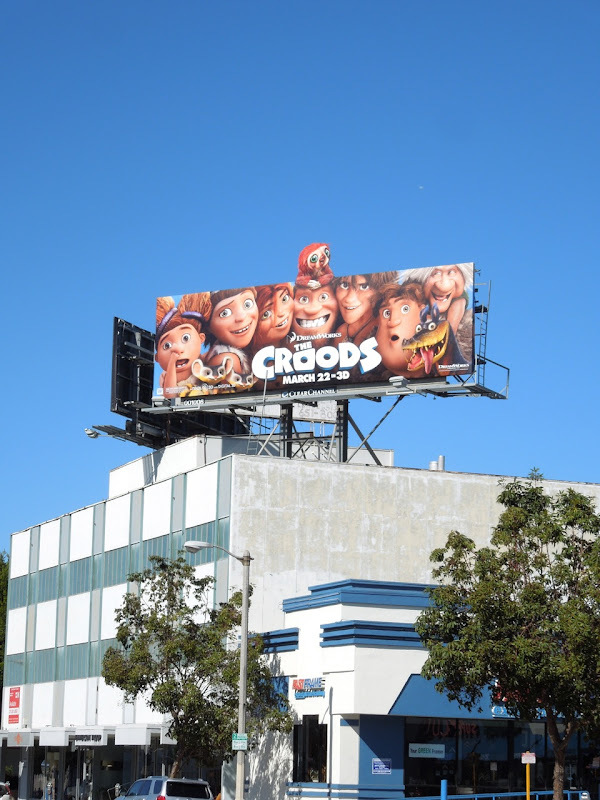 Move over Flintstones, there's a whole new gang of cavemen in town. 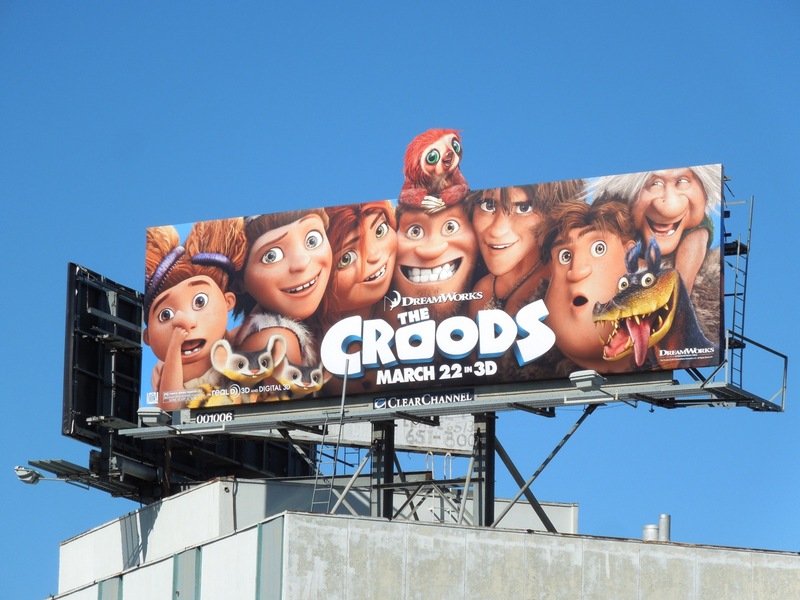 Meet The Croods. 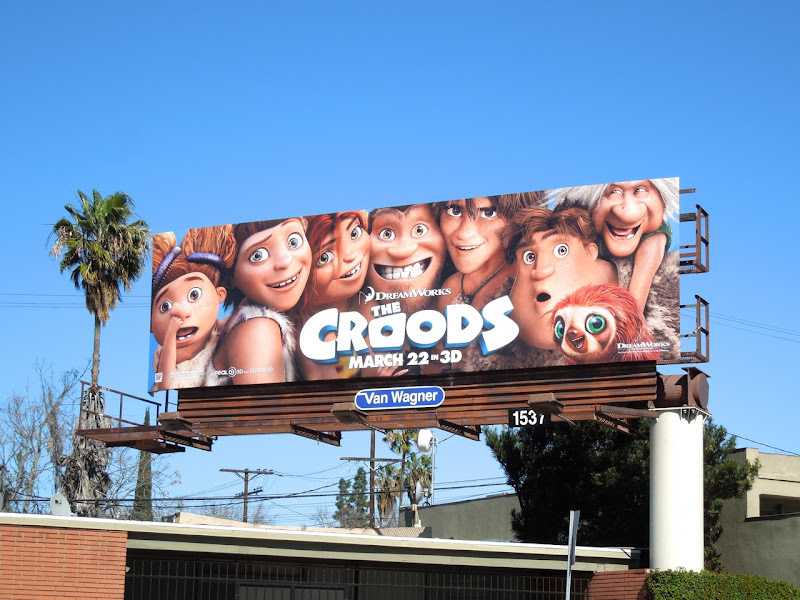 This new computer-animated prehistoric family are sure to win hearts over as they venture from their cave on a fantastic adventure. 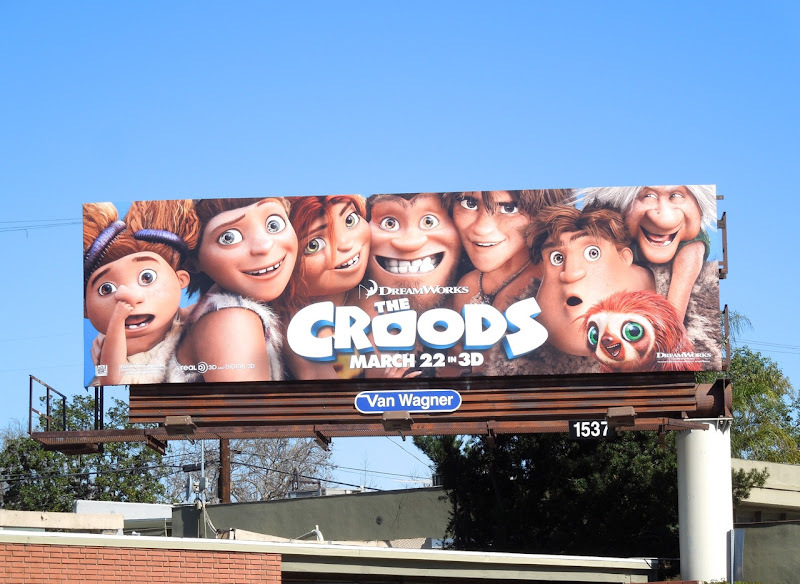 An all-star cast including Emma Stone, Nicholas Cage, Ryan Reynolds and Cloris Leachman provide the voices of Sandy, Ugga, Eep, Grug, Guy, Thunk and Gran. 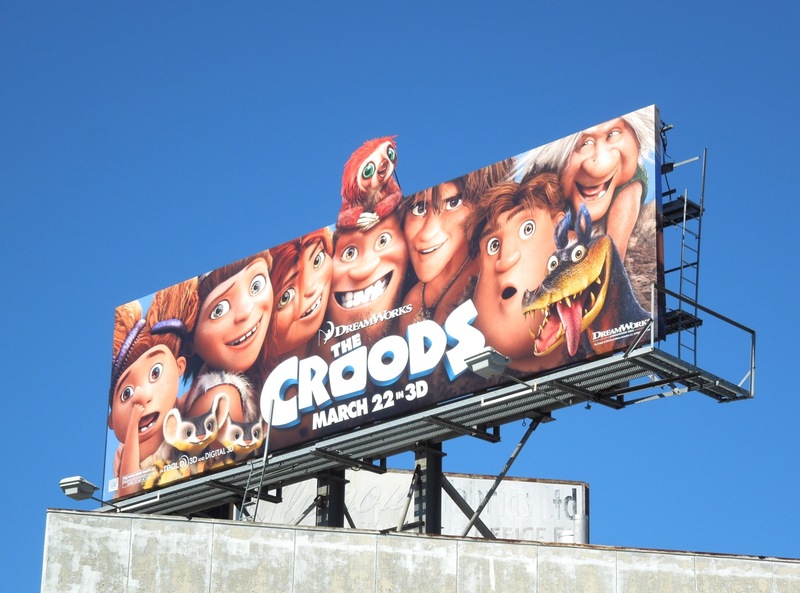 These jam-packed billboards certainly catch your eye, especially the ones with the world's first pet, the sloth 'Belt', perched on top. 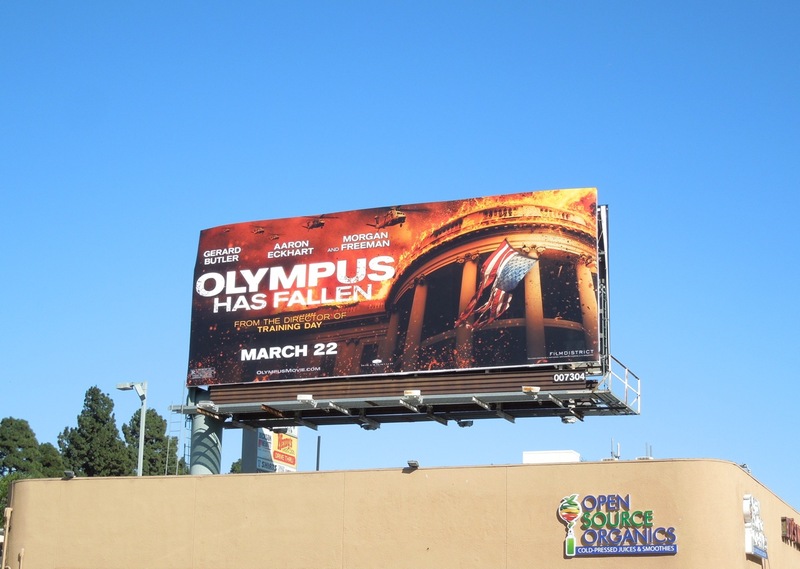 The special extension billboard was spotted along Beverly Boulevard, whilst the standard version was spied along Melrose Avenue on February 20, 2013. 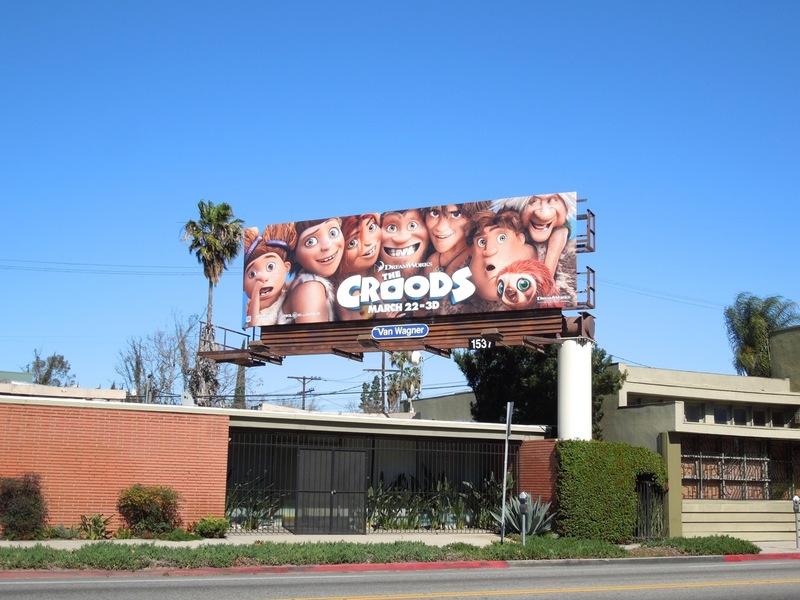 If you're a fan of animated feature films, be sure to also check out these other DreamWorks animation billboards. 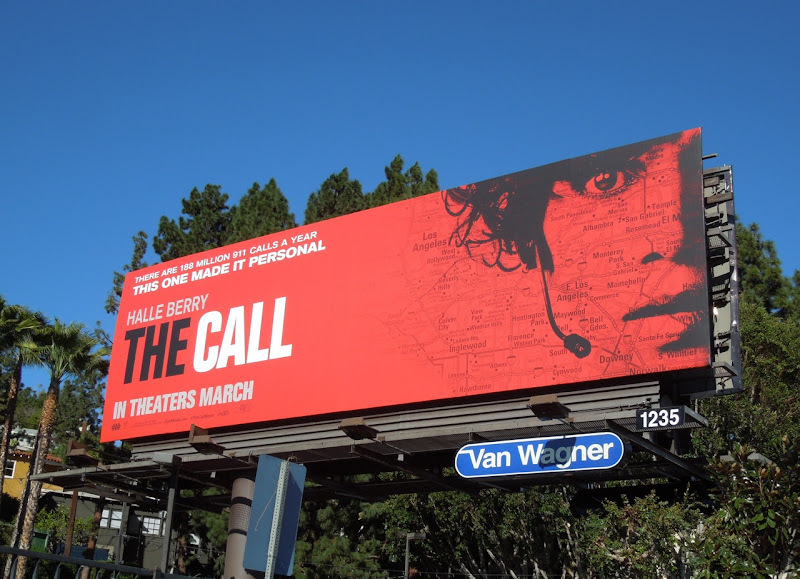 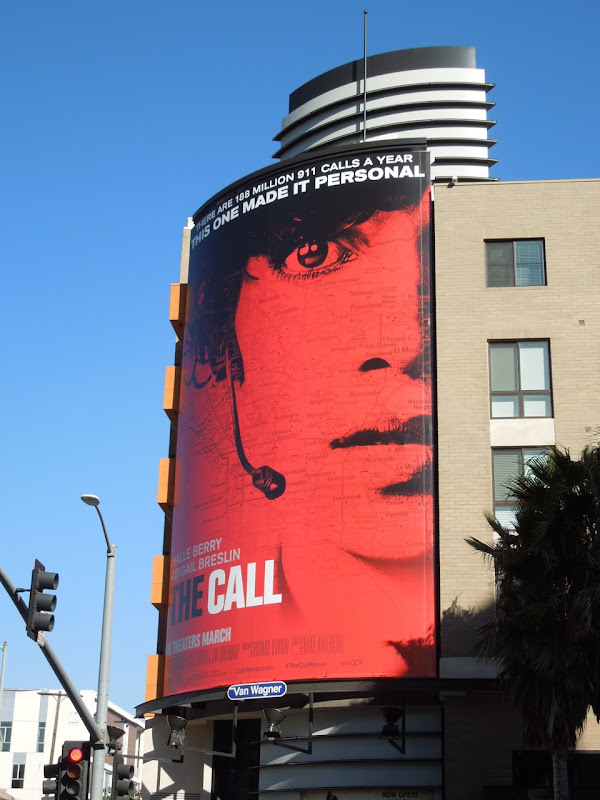 There's nothing quite like a really strong visual to start the week here at Daily Billboard and this one comes courtesy of Halle Berry's new 911 movie thriller, The Call. 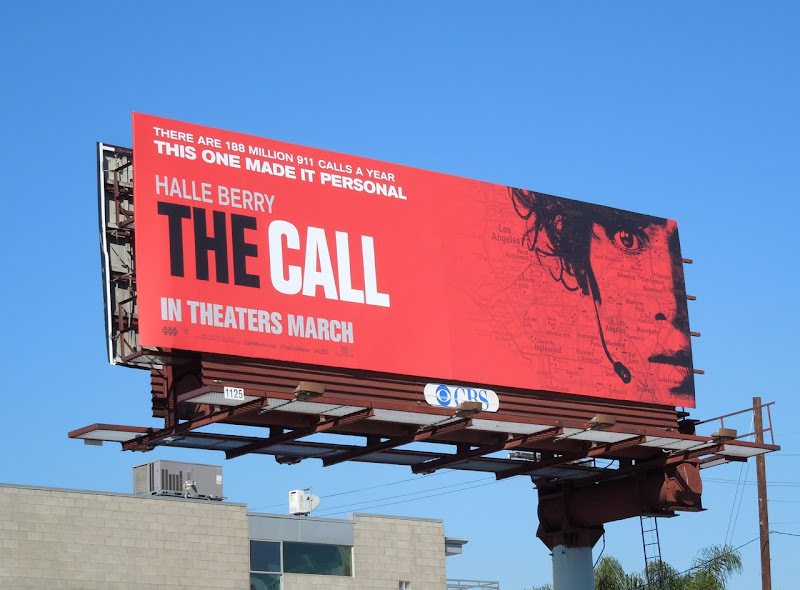 It's really not surprising that Daily Billboard likes this striking red creative though, as the colour scheme is reminiscent of this giant red movie billboard for Thor and even this creative for HBO's The Girl. 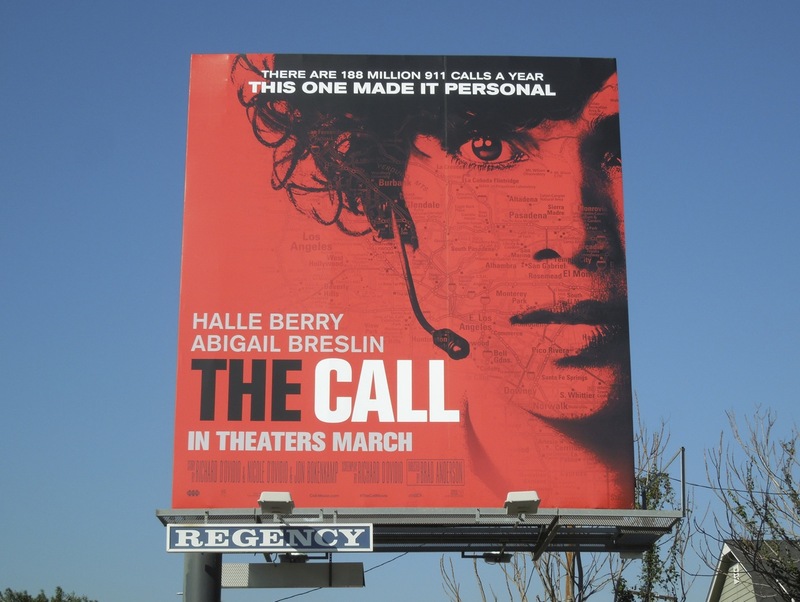 In the movie Halle Berry's veteran 911 operator receives a distress call from an abducted teenage girl (played by Abigail Breslin), and must face her fears to save the girl's life from a deranged killer from her past. 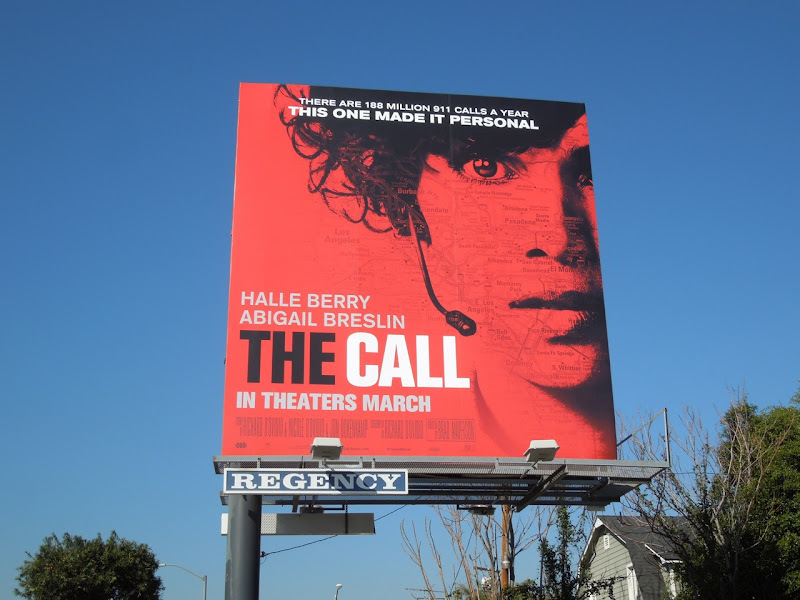 These different format billboards were spied all around the streets of L.A., which is quite appropriate really, as you can see a map of Los Angeles and the surrounding area overlaid onto the face of the actress on the billboard creative. The standard landscape billboards were snapped along Sunset Boulevard and Melrose Avenue, the squarer format along Fairfax Avenue, the larger version along Highland Avenue and the duo of billboards opposite the Cinerama Dome at Sunset & Vine in Hollywood from February 13 to February 22, 2013. 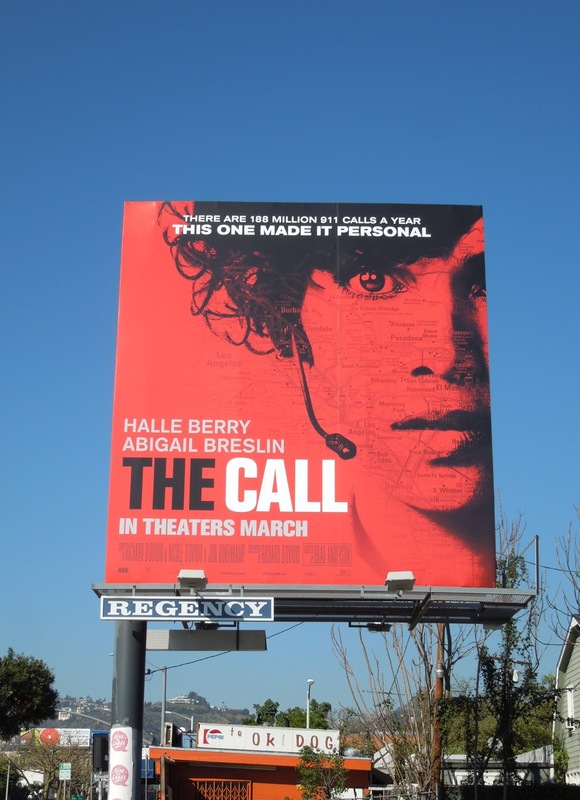 Cloud Atlas was totally overlooked by audiences last year, so let's hope The Call will be more successful for Halle Berry and hopefully not a stinker like Catwoman was. 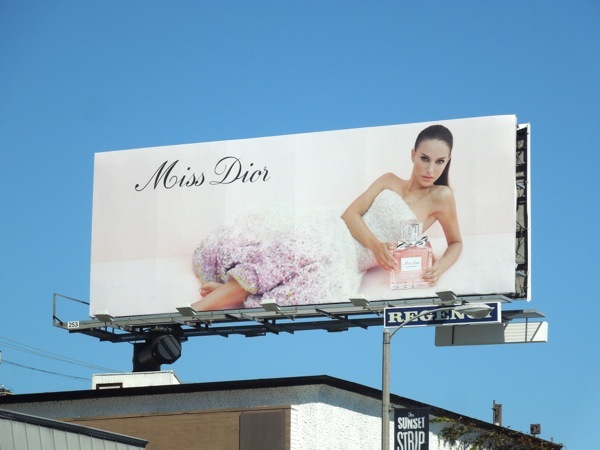 Academy Award-winner Natalie Portman looks pretty in pink and flirty and feminine in this new billboard creative for luxury perfume Miss Dior from Christian Dior. 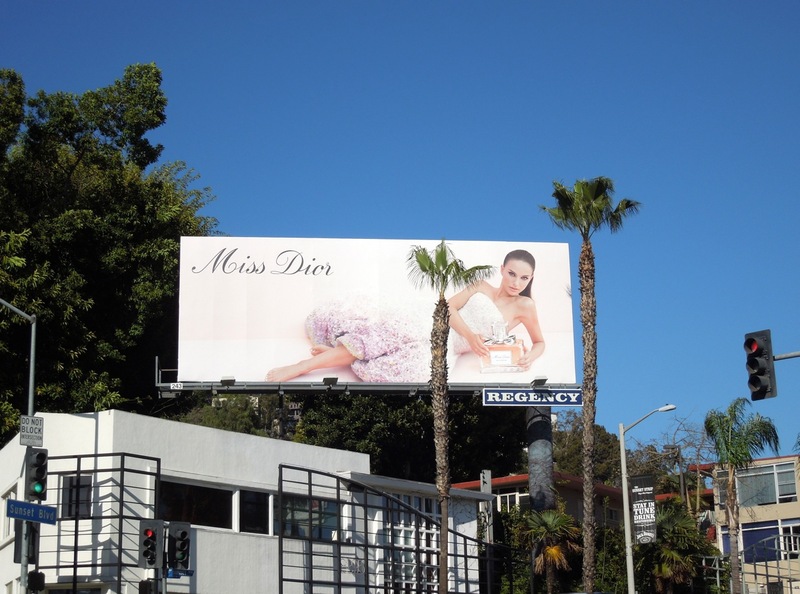 This elegant and romantic Miss Dior Eau de Parfum billboard was snapped along L.A.'s Sunset Strip on February 11, 2013. 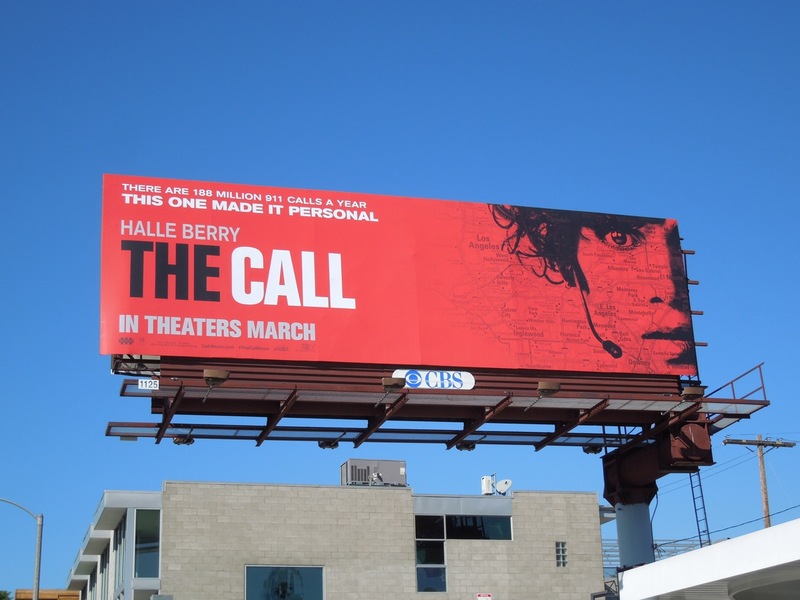 If you're a fan of the actress, you should also check her out in this Your Highness movie billboard and these No Strings Attached movie billboards. 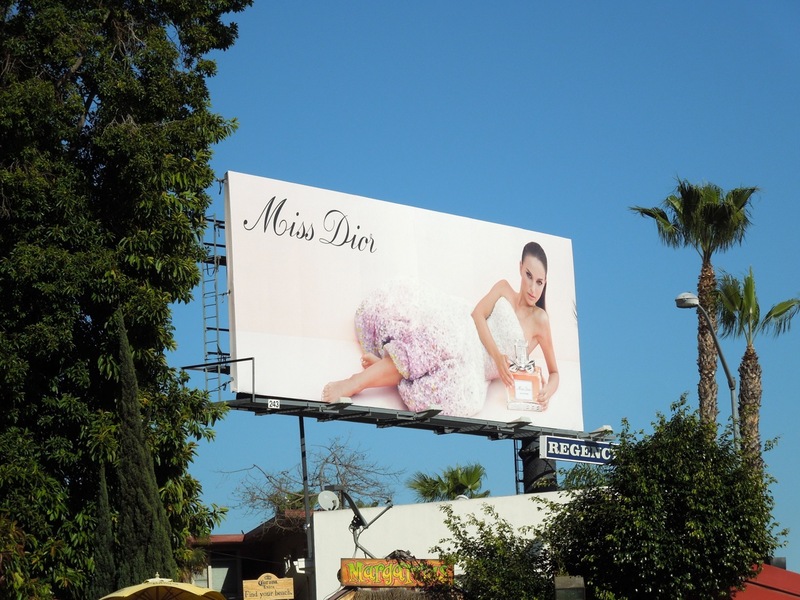 Plus if you like this ad creative, be sure to take a look at these other designer fragrance billboards featuring celebrities, like Charlize Theron's Dior J'Adore billboard, Blake Lively's Gucci Premiere ad, Brad Pitt's Chanel No.5 billboard and more besides here at Daily Billboard. 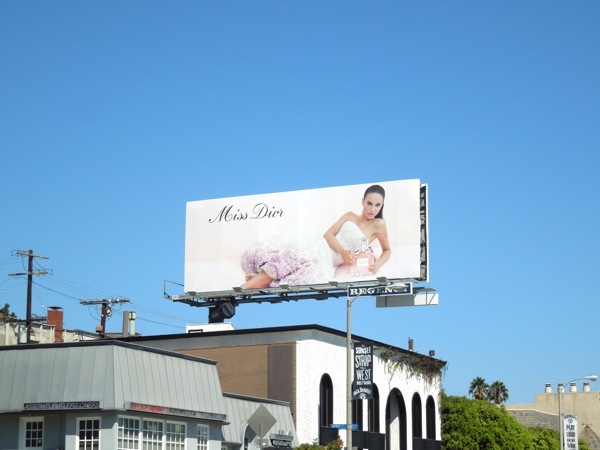 UPDATED: Daily Billboard is delighted to announce that Natalie Portman has returned to grace the skies of L.A. once more for Miss Dior, and this time our view of her is totally unobstructed by palm trees. 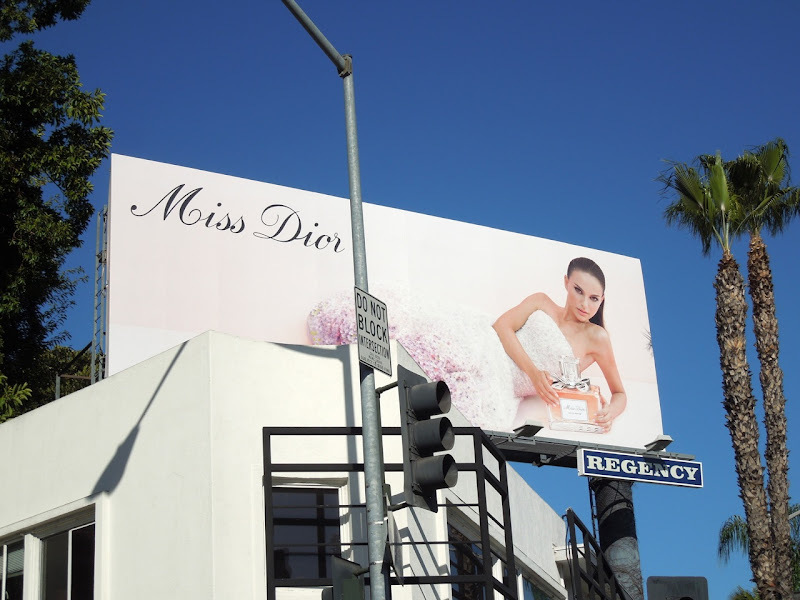 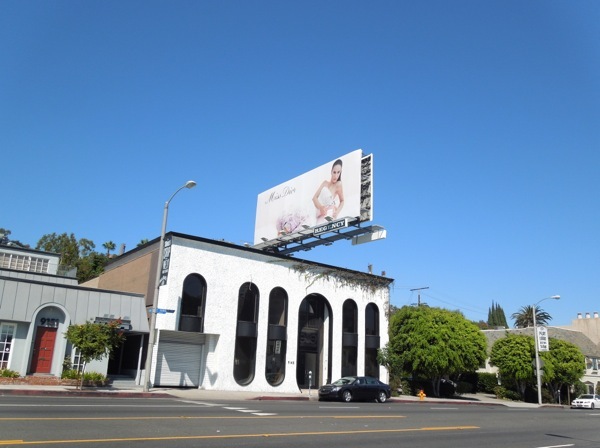 This time the perfume ad has resurfaced further west along Sunset Boulevard and was spotted on September 12, 2013. 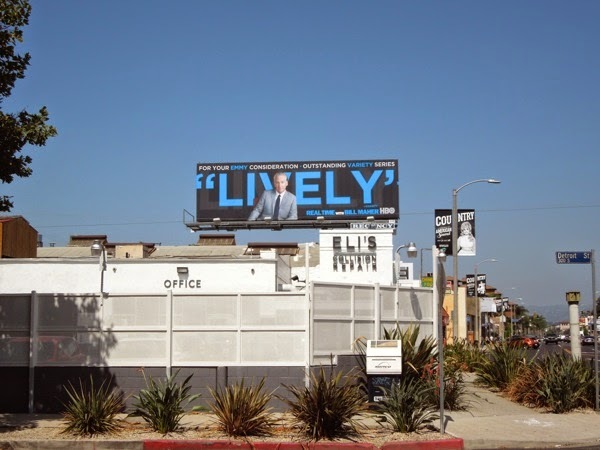 Enjoy it in all its beauty. 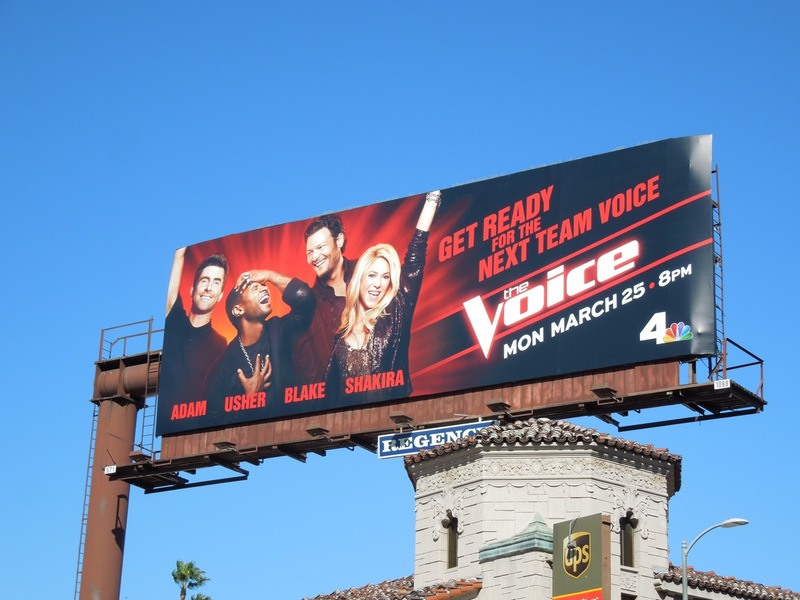 This fourth season billboard for The Voice clearly illustrates that these reality show competitions are now all about the judges and coaches involved, rather than searching for the best new singing talent, as Usher and Shakira step in to fill the temporarily vacant chairs of Cee Lo Green and Christina Aguilera. 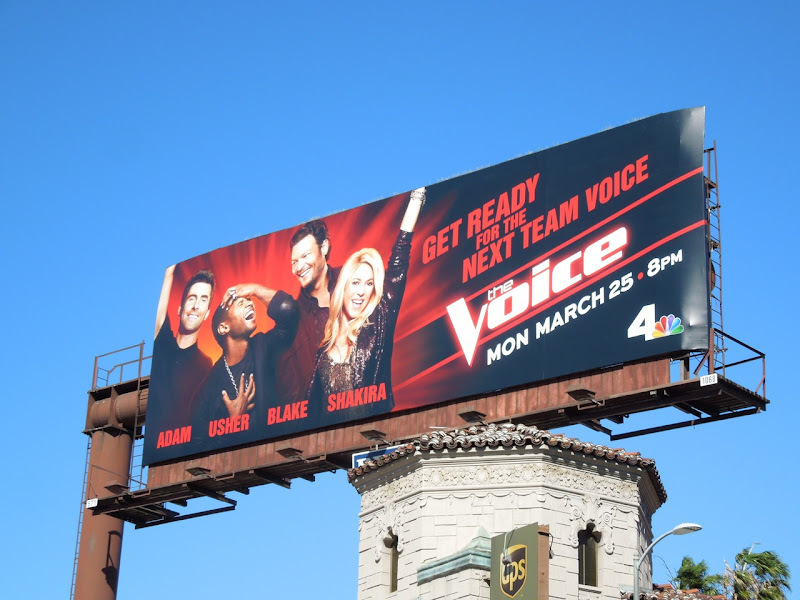 There's no doubt the two stars joining Adam Levine and Blake Shelton have the vocal, coolness and diva credentials, but only time will tell if they have the same on screen chemistry as their predecessors. 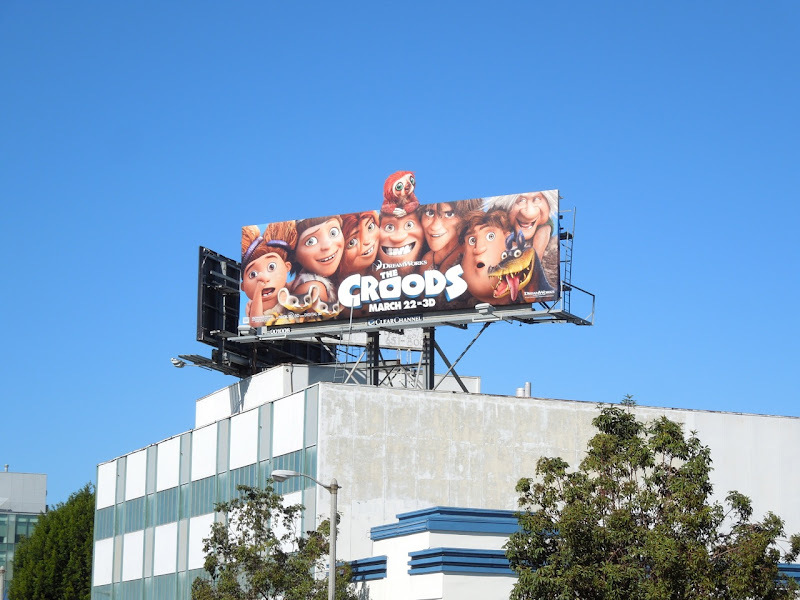 This season four billboard was spotted along Sunset Boulevard at Laurel Canyon Boulevard on February 20, 2013. 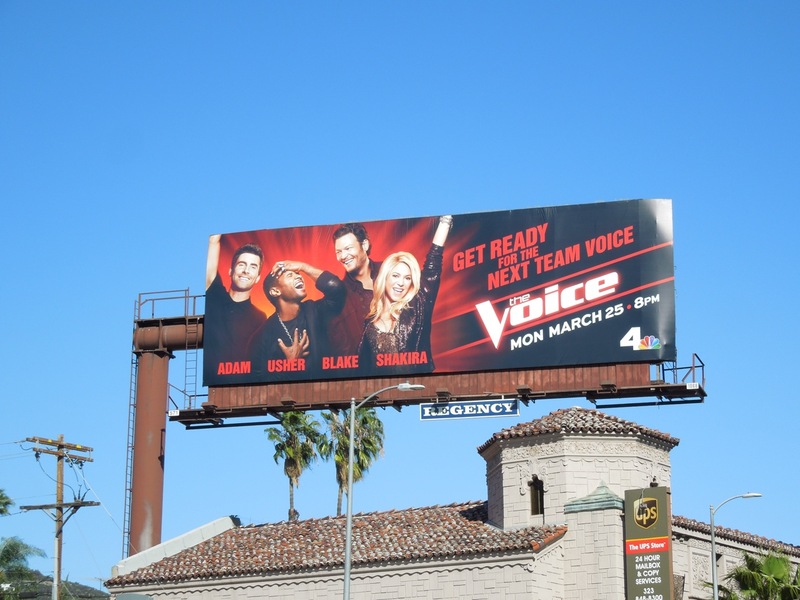 If you're a fan of the show, be sure to also check out The Voice season one billboards, The Voice season two billboards and The Voice season three billboards. 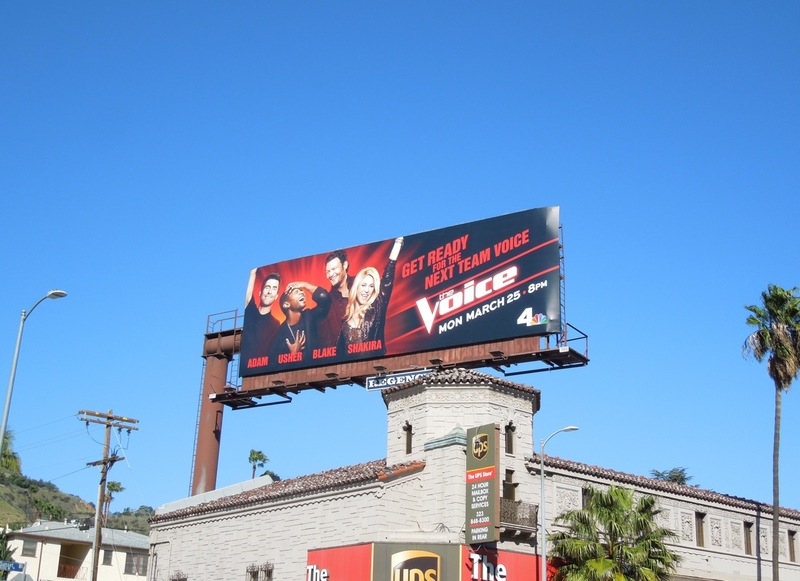 Let the blind auditions begin.